The concept of halaal certification was initiated some three decades ago and mainly in non-Muslim countries. It is ironical that Muslim countries especially the Middle East and also countries such as PAKISTAN had not given any attention to this important facet of Muslim life. It is a general perception that all food items manufactured and/ or sold in Muslim countries is unquestionably Halaal. Thus, you would find a plethora of imported products on supermarket shelves many of which contain questionable and even Haraam ingredients. The local industry too would utilize imported raw materials in the manufacturer of products with little or no verification of the Halal status of such components. 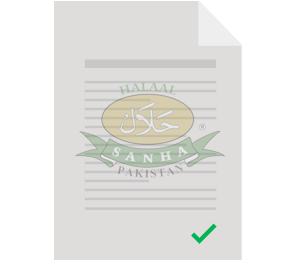 The foundation for Halaal certification in Pakistan was laid in 2005 by a company who were desirous to obtain verification and confirmation of their products’ Halaal compliance. In a sincere quest for bona fide Halaal certification body with acknowledged repute, they travelled far and wide and finally located the South African National Halaal Authority (SANHA, South Africa) on the southernmost tip of the African continent. In the ensuing years, many more companies embraced SANHA’s Halal certification program. Due to the growing interest and industry demand, it was felt that this service be handed over to the local community who may take ownership and responsibility to provide the required logistical support to the industry & maintain continuity and consistency of the Halaal certification program. Accordingly, selected individuals, who had received extensive training in the field along with reputable scholars and community members, were appointed to form a locally registered organization in Pakistan. Thus the establishment of SANHA Halaal Associates Pakistan Pvt ltd (SANHA PAKISTAN) was realized. To provide a credible Halaal certification and monitoring service so that the rights of Muslims to have access and consume Halaal food is protected and promoted. Confidentiality is the cornerstone of our interaction and association with the industry. SANHA, thus, guarantees absolute confidentiality regarding intellectual property & trade proprietary information. The SANHA logo is not only the face of the organization; it is a registered trademark which signifies integrity, credibility and assurance in Halaal for both the consumer and the industry across the globe. Obtain Halaal certification and let the SANHA logo add value to your brand.